Popularly known as the Santorini of Korea, Gamcheon cultural village is the most colorful village you would have ever seen. 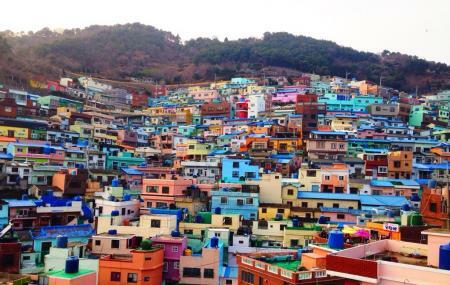 It is the most art-filled village of Busan, located at the top of hills of Saha-gu in Busan. Once you land up at the bottom of the village, the colorful narrow alleyways will guide you to reach every important sights of this village. People say that the best way to travel around this place is to get lost. Every year, it attracts around thousands of tourists and photographers from all around the world. To know about the Gamcheon cultural village history, visit the information center first. From there, buy a tour map that will guide you to locate the tourist sites. While moving around the village, you will see colored wooden fishes on the walls of the street that actually acts as directions. Make sure you visit the Observatory center to get panoramic view of the village. Beside this, there are lots of museums, cafes and restaurants to spend time. The Gamcheon Culture Village food is a must try. Also, visit the popular attractions in the city by following Busan itinerary 1 day. Instead of buying the tour map, you can take a snap of it in your phone to locate the major sights of this village. The Gamcheon Cultural Village is open all year round. Some facilities in the village have fixed hours. Refer official website or ask locally for details. Toesong Station. From there, you can hike to reach the top of the village. Gamcheon elementary school is another stop. To reach here, take bus no.- 2 or 2-2 from Cancer Care Hospital. How popular is Gamcheon Cultural Village? People normally club together Paraeso Falls and Taejongdae Park while planning their visit to Gamcheon Cultural Village.